Mineski claimed eight consecutive victories during the qualifiers: they defeated Clutch Gamers, BOOM ID, Execration, and TNC Pro Team with a 2 to 0 score. No one has been able to stop the team captained by Mushi! Among the other members of the current SEA All-Star team we find veterans such as Daryl Koh "iceiceice" Pei Xiang and Michael "ninjaboogie" Ross Jr. The first match ended in 33 minutes with an overwhelming 29:8 score. 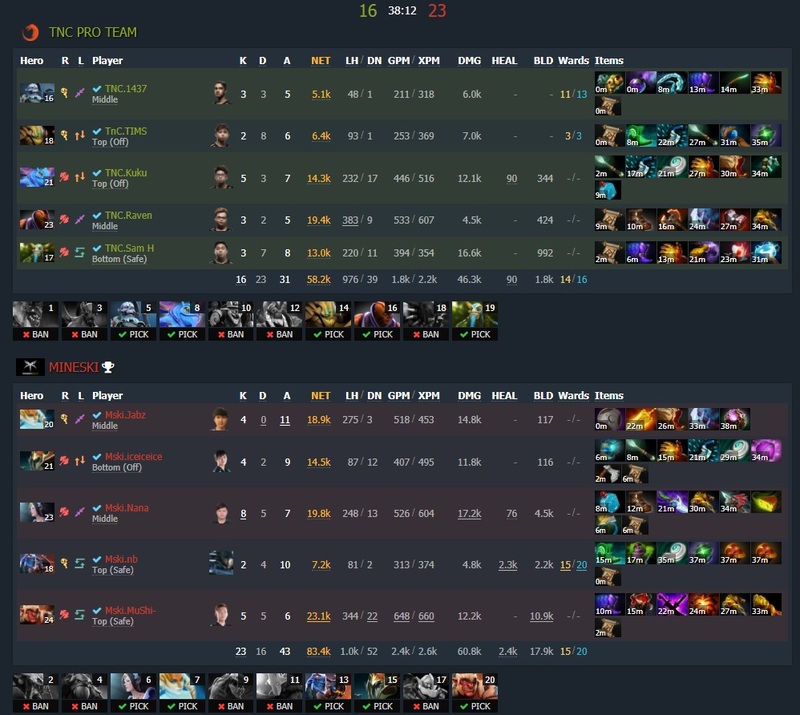 Kam "NaNa" Boon Seng, playing Mirana in the mid lane, carried the game with 11 kills and 9 assists. He opted for a very conservative build to counter TNC’s heavy magic damage lineup: Dragon Lance, Linken’s Sphere, and Black King Bar. The second game was rather balanced for the first 20 minutes, with the carries of both teams freely farming most of the time. Afterwards, more fights took place on the map, predominantly in favour of Mineski - there are only 5 of their deaths recorded after the 25 minute mark. Despite the solid attempt of Marc Polo Luis "Raven" Fausto on Anti-Mage, Mineski's 4-slotted Naga Siren continued pressuring all lanes undefeated. Mineski will join Team Liquid, Newbee, and the remaining five qualified teams at Kiev, Ukraine on October 10. SL i-League Invitational Season 3 is the first tournament in the 2017-2018 competitive Dota 2 season and as a Minor will present a $300,000 prize pool.